WRIO Internet OS is an open-source Ethereum-based platform (PaaS) for cloud and distributed mashup apps (SaaS) that creates a secure browser-driven operating system. It provides an API-free, global, decentralized pool of open, shareable, reusable, and machine-readable semantic data, featuring a user-centric Web 3.0. For users: security and privacy - spam-proof, malware & virus-free browser-driven OS; full control of personal data and assets stored in the blockchain and utilizing the Profile; custom set of applications using a single sign-on and uniform predictive UI; no need to download, update, install or setup any software; user-centric web 3.0 browsing experience; full access to a free and censor-proof global semantic data pool, featuring Dark web support: VPN, Tor, I2P, etc. ; proactive filtration of incoming information and automation of web activity using Individual Assistant; Access to a Dashboard, customized with an automatic arrangement of bookmarks based on your preferred content using AI. For authors: fully automatic search for relevant readers through Recommender System; monetization of creative activities, using the Crediting function; easy funding of your creations, using crowdfunding functionality; comments and promotion through advanced tweets; authorship acknowledgement through saving the date, link to, and hash-sum of the creation in blockchain through the digital fingerprint functionality; content is censor-proof and block-proof. For entrepreneurs: replacement of obsolete web 2.0 sites with web 3.0 hubs without a string of code: web development becomes redundant through the capabilities of web 3.0, eliminating setup and technical support issues as well. Functionality is rich through cloud/distributed apps; automatic connection to the global semantic data pool. Linked Data — availability of third-party content without copy/paste or API; semantic structured pages ensure high organic search positions (top of search results); anonymous though all-encompassing statistics and analytics based on the Interest Matrix for efficient business operations; Offers which provide a substitute of expensive, untargeted, and inefficient adds. For developers: development of cloud/distributed apps using a global semantic data pool; single sign-in with free access to the decentralized pool of users; security boasting private user data which is effectively protected through blockchain cryptography; browser-driven nature of WRIO OS guarantees the absence of cross-platform, cross-browser, cross-device, and responsive problems. Frontend development is not required as a ready-made set of controls and elements is provided. UI is determined by a theme selected by the user. All developers’ efforts are focused on the development and support functions (backend); cloud services will guarantee the user always uses an up-to-date version with the absence of compatibility issues without need of the support of the previous version; zero piracy, simple monetization of applications, and automatic search for relevant users based on behaviors and interests; cloud/distributed web 3.0 apps marketplace provides a free and secure market that does not have censorship or requirements. Regulated through the Rating and Web of Trust. The ease of usage is something that will help this project to gain popularity as users today are all looking for the convenient in everything, even more so when they are browsing the internet. Interested to see it being able to perform well on mobile devices as well. First WRIO Internet OS node . A global data pool, first hubs. Core. Web 3.0 content management system. 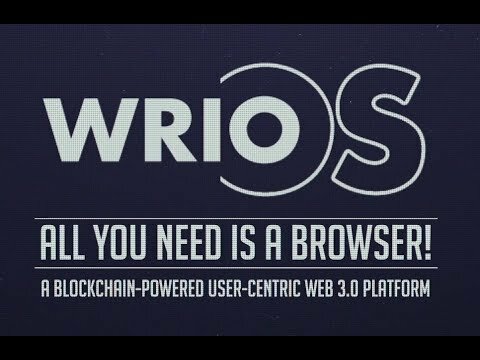 WRIO Internet OS ICO: WRIO OS tokens for webGold. Exchange. Stock Exchange will offer WGD / CRD pair. DAO management system. Provision of tools necessary to create DAOs. Smart Contract Wizard. Mobile app, WRIO OS browser. Dark web support: VPN, Tor, I2P, etc.